One aspect of the Digital Humanities that I think tends to get neglected is the aesthetics of presenting research material, and what attracted me to Vectors is their exploratory attitude to this. 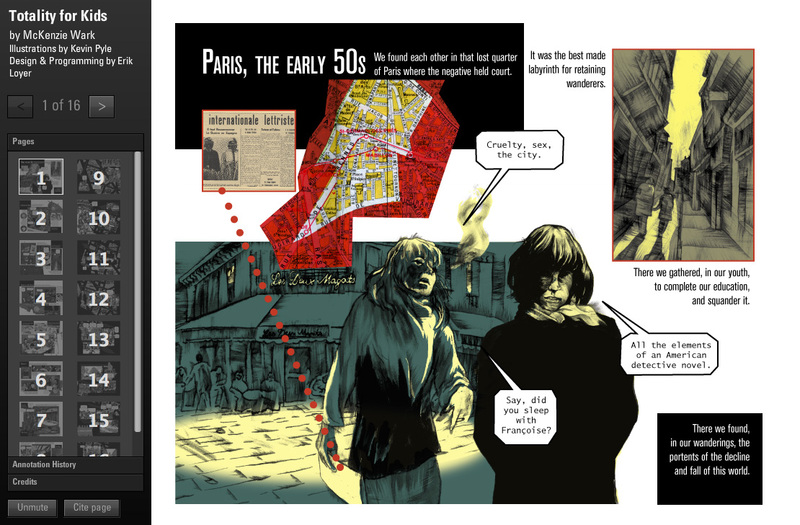 The project features an annotated comic that recounts the history of the Situationist International. Adobe Flex 3 Software platform incorporating an MXML markup to render Flash projects. Since its publication in 1993, interactive media designers have turned to Scott McCloud's Understanding Comics as a kind of bible for visual communication in the digital realm. At first blush this may seem a bit odd, since the book doesn't make any great effort on its own to address digital technologies (unlike McCloud's later work Reinventing Comics). For me, however, and I think for many interactive media designers, the appeal lies in the way McCloud reveals that latent within comics is a ready-made, compact language for rich visual storytelling that, in its iconicity, lends itself to the symbolic languages of computers, not to mention low budgets. Unlike in a AAA video game, compelling storytelling using the affordances of comics doesn't rely on photorealistic rendering, sophisticated artificial intelligence, legions of production artists, or other accoutrements typically out of reach of the individual designer. Instead, we find a set of simple, accessible, and powerful tropes for defining the shape of time, space, and perception. The potentials that emerge when comics go digital have been a longtime fascination for me across multiple projects, and so when I learned that McKenzie Wark's project on the Situationist International involved a retelling of the history of the movement in comic book form, I immediately wanted to work on the project. Though our digital adaptation of the comic commissioned by Wark is more of a gesture toward these potentials than an in-depth exploration, I think the way the project makes digital objects of comic book visual language fundamentals like panels and dialogue bubbles, linking them to further explications of their content, hints at fruitful future directions. What happens when the content and characteristics of a panel in a digital comic become truly data-driven and responsive?